While moving in tandem with other industries in the digital transformation arena, healthcare organizations still face stiff challenges in designing lean processes that allow better clinical data aggregation, protect patient privacy, and negate the inefficiencies of legacy systems. Despite many technological advances, a comprehensive solution that addresses these challenges is hard to come by. The Michigan-based firm Skytron was born out of this necessity to resolve these issues. The firm provides equipment and software solutions designed specifically to enable clinical data aggregation–presented over a dashboard–to gain an understanding of various aspects of healthcare information, alongside driving compliance among healthcare staff and more. “Our systems promote information sharing, efficiency, and safety gains, allowing healthcare organizations, clinicians, and physicians to make better and faster decisions,” says David Mehney, CEO of Skytron. The company worked in partnership with New Compliance from the Netherlands OR Cockpit+, a real-time, centralized safety system for surgery that equips surgical teams with smart information, dynamic compliance, and safety protocols, clinical business intelligence, and increased workflow control. The system aims at enhancing patient safety and process efficiency with increased awareness and the adjustment of behavior and workflow processes. Skytron’s operating room (OR) management solution contains a visual dashboard, tailored to create a proper environment for patients in the OR by aggregating all the patient data and providing the same information through the visual management to the team. It not only improves patients’ safety but also enhances the operational efficiency of the surgical department overall. Skytron achieves this by integrating its system with a hospital’s EMR for primary patient and demographic information and hospital policies, to ensure that everything runs as per protocol. Alongside this, the dashboard also encompasses an automated surgical as well as patient security checklist that guarantees compliance with a particular surgical procedure. “Though we have guiding principles and recommendations to configure the dashboard, the biggest benefit is that it assists healthcare organizations to visualize its policies and acts as an effective tool in tracking a circumstance-specific matrix. Besides, our solution has a backend analytics tool that allows for data analysis, and the information gleaned can be used for training, learning, quality assessment, performance improvement, and predictive analytics for formulating strategies, and more,” explains Jennifer Daniel, Assistant Product Manager at Skytron. Being a privately owned equipment company, Skytron’s underscoring philosophy is to grow by increasing collaboration with market leaders. The firm has already positioned itself as a niche player in the operating room equipment landscape and is committed to offer solutions that enhance efficiency and improve patients’ safety. “Our solutions promise reliability, versatility, and long-term cost-saving,” remarks Jim Pytlik, Director of Clinical Business Intelligence at Skytron. Moreover, the firm carries out successful transactions with local vendors and distributors that have added a different flavor to Skytron’s business framework and allowed the firm to be more responsive in its endeavors. Backed by a strong product line along with an innovative team and inspiring leadership, Skytron is disrupting the healthcare landscape and its products and solutions are deployed by major organizations across the United States. Currently, Skytron builds UVC robots that can significantly improve patients’ safety and clinical efficiency in the operating room. Since these robots can assist in disinfecting ORs, they can aid significantly in reducing HAI. Continuing the journey forward, Skytron envisions introducing new products in all categories by the end of 2018 or the beginning of 2019. This fits perfectly with Skytron’s vision of launching new products every five years. All in all, Skytron’s endeavors demonstrate the efficacy of its products in adding value to the healthcare ecosystem. 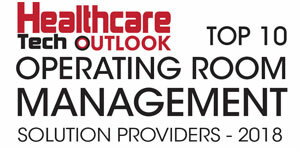 “We provide unique operating room management solutions that nobody else in this domain can offer,” concludes Mehney.